MaxRoam was launched today by Pat Phelan’s Cubic Telecom. MaxRoam initially offers a sim card for your mobile phone which you use when roaming. The sim card costs â‚¬29.99. 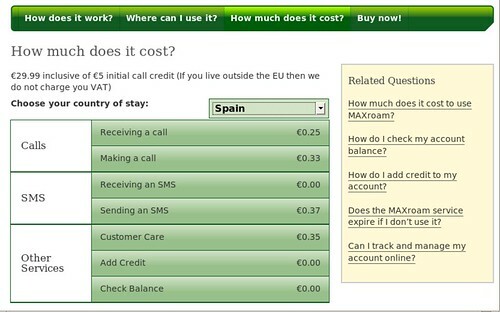 You can add multiple numbers to the sim card so that, if you live in Ireland, for instance but visit Spain frequently, you can have Irish and Spanish numbers mapped to the phone. You give the Irish number to your Irish contacts and the Spanish number to your Spanish contacts and everyone is making low cost calls. This is great. â‚¬29.99 is about 1/10th of my last Vodafone bill when I was abroad! Where it is even more impressive though is when you are in Spain (again, for example), receiving calls, the cost is far lower than receiving calls using your standard mobile operator. If I send or receive texts in Spain on Vodafone’s network they charge me 49c (on any other Spanish network they charge me 65c). With MaxRoam receiving texts in Spain is free and sending texts on any network is 37c. Call charges with MaxRoam are similarly cheaper. Receiving a call is 25c (per minute, I assume), making a call is 33c p/m. 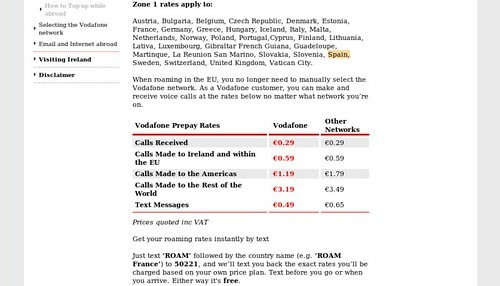 Vodafone charge 29c p/m to receive call, 59c p/m to call within the EU â‚¬1.19 p/m for calls to the Americas and an eye-watering â‚¬3.19 per minute for calls to the rest of the world. I choose Spain for this example ‘cos I have family living in Spain and go there regularly but you will get similar numbers for other countries. What I am not clear on is when you are in another country, are you locked to a particular local mobile provider or will any work. I know Pat well and while he’s a lovely guy, I know he’s not doing this out of the goodness of his heart. If Pat can charge these low rates and still make a profit, how much are the mobile operators coining in? What we will do is put YOU first, hereâ€™s my mobile +353872049121, if we leave YOU down in any way call me up and give me a piece of your mind. And renowned Technology writer David Pogue gives MaxRoam a great write-up in the New York Times. Nice to see Cubic telecom’s maxRoam working! Even though I didn’t attend Techcrunch40 they surely where one of the winner for me. Congrats for their great product. Alex – hola! Mi mujer es una Sevillana! I am having this past week an experience using MAXROAM. I have mixed feelings. The basic phone calls do work and somewhat smoothly and a nice clear signal. The MAXROAM user interface and the company’s customer service is awkward, confusing and not customer friendly. The order was not configured as I requested in the first place. They offered a choice of USA Area Codes for the first number assignment. I choose a west coast area code and they configured with an Georgia area code. The chip was received in a plain white envelope (not insured – no signature required) and later I find out contrary to their information, the chip was already activated so my 89 Euro value was open to be stolen. For some reason, they activate the chip when they process the order rather than having the client activate after receiving the chip. Next they advertised local numbers in over 150 countries. So I logged into my account and requested a local number in the country of Latvia. – NON AVAILABLE was the reply. I complained quite severely and they reacted quite severely! Its now been well over a week and they have assigned a local Latvia number but in order to make it work, you MUST dial it using the International calling technique which means that you have to dial the countrycode infront of the number. So If I call to the local Latvian number from abroad it works. If I call the number using Skype, it works. But, and it is a BIG BUT; the Latvian phone companies will NOT allow you to dial a local Latvian number using the country code first. So, I have a local Latvian number; but, no one inside of Latvia can call it! Wow, the MAXROAM management at this point is offering to give me my money back – full credit to my credit card. Now, I am being the devil again. I want what they advertised! Will see if the MAXROAM management will live up to their advertising or will leave the “chip on their shoulder” so to speak. In any way you look at it, the MAXROAM online info is incorrect, misleading and in some cases simply not the way it is. Oh, yes, my online account still shows incorrect numbers and is missing the FREE credit they offered me for my troubles last week. MAXroam has serious problems with its service. I had a very similar experience to Mike Johnson. First, they gave us a wrong phone number, just as above. Then, although they charged us in full and we paid for registered mail, we never received the SIM card. To add insult to injury, they wouldn’t respond (or even acknowledge) many of the requests for help I sent them. When they did respond, they just dismissed the requests without resolving them. Clearly, their management is not ready to provide quality customer service. I would advise you to stay away from this company until they get their act together (or go bankrupt).